Jon Hammer is a self taught artist who began by daubing the streets with activist punk slogans in the early eighties. On discovering the book ‘Subway Art’ in early ‘85 his new direction was set. He started ‘writing’ on the Underground Railway during London’s graffiti heyday from ‘86-’88, using the tag ‘Elate’. The Acid House movement that followed blew a channel to his inner voice and painting backdrops replaced trains. The scene quickly faded and he switched to canvas and began reading an array of subjects, focusing on the history of painting and the transcendental arts. Drawing inspiration from the masters of painting and the intuition of shamanic lore he has patiently and methodically developed his natural ability. 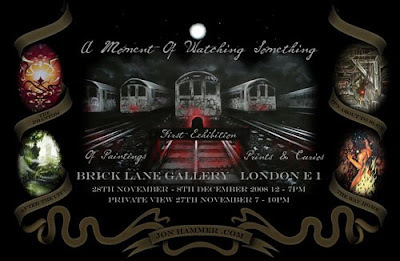 His debut exhibition will be at The Brick Lane Gallery this Thursday, 28th November . There is a private view for collectors is on the 27th November.Numerous original paintings will be available for sale, also prints, including some customised one-offs as well as various curios and oddities.